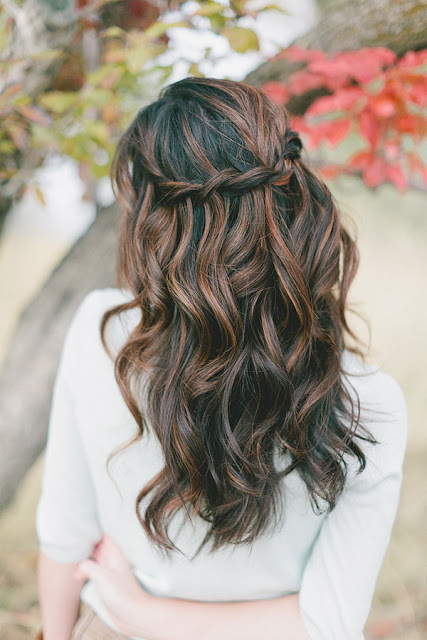 Deciding how to do my hair for my wedding was the hardest thing ever for me! I changed my mind every day, there were so many things I liked! How can you choose just one? Plus what will look good in pictures? And what will last all day? After working with a lot of brides, I've noticed a lot of the pros and cons for each type of wedding hairstyle. Whether you go with an updo, half updo, all down or to the side, here are the pros and cons for each one. -It's goooorgeous, especially if your hair is extra long. -It's comfortable. You won't have a headache by the end of the day because you won't have a million bobby pins in your hair. -It's moveable. 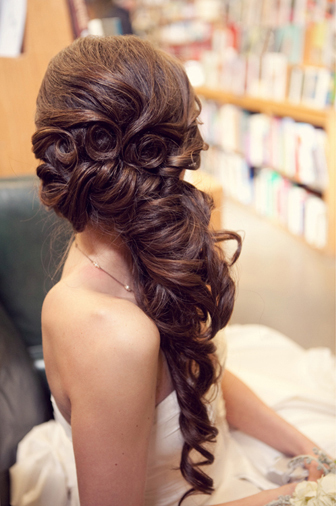 You won't have to worry about it moving around because unlike an updo, it's supposed to move around! -The biggest con for hair that's all down is that it's the least predictable wedding hair style. Since it is moveable, it's almost impossible to keep everything in place. By the end of a long day it can look ratty and messy. One out-of-place curl can ruin a picture, and it's hard to keep volume and shape in hair that's not pinned at all. -If you are going to wear it all down, make sure you have time to touch it up through out the day. If you can touch it up a few times, by the end of the night it should still look great. It also helps to start a little curlier at the beginning of the day to give it some room to relax a little and still look good. -You get to keep the look of long curls while still having the security of bobby pins. Best of both worlds. 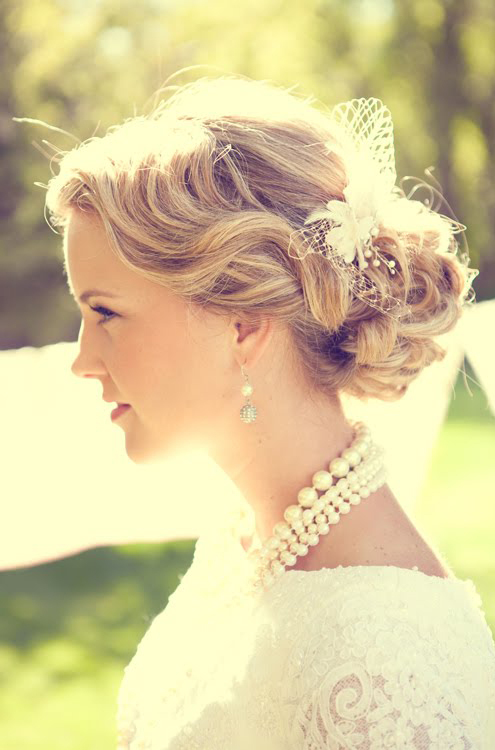 - It's easier to find a place for hair accessories in half updos than in all down styles. -Since the top half is pinned up, it's a lot more likely to hold shape and body for the whole day. -If you aren't comfortable with an all up-do, I would choose a half-up style over an all-down style. It will be more secure, hold it's shape better and it's an easy way to fancy up an all-down style. -So fancy schmancy and fun! When do you ever get to wear a beautiful updo and not feel overdone? Your wedding is the perfect occasion. -There are SO many options. An "updo" can mean so many things and fit so many different styles. -It will hold it's shape all day, making it more likely to look good in pictures. -Some updos can look boring from the front. -They can be uncomfortable, especially if you have really heavy hair. Make sure you really love your updo not only from the back and side views, but from the front too. Keep it soft and feminine around your face so it's more interesting. It helps to leave out some soft curls to frame your face. -If you are wearing it long and side swept, it's just like the half updo in the sense that you get to keep the length while still having the security of bobby pins. -It will look good from the front and in pictures. -It can be uncomfortable. Most side updos are low set on the neck, and having an updo right there at the base of your neck by your ear can be annoying after a while. -In pictures, one side will look great, but the opposite side can look boring. -Make sure you know what side of your hair will be facing the audience during your ceremony, and do your updo on that side. Also try to be aware of what way you are facing while your photographer takes pictures. Always try to have the side with the updo towards the camera.